Named “The West’s Best Short Whitewater Trip” by National Geographic, a Westwater Canyon rafting trip should not be missed. This canyon was formed by a section of the Colorado River slicing through the beautiful red, black, and gold landscape of the remote Utah wilderness. As the canyon walls narrow, the rapids become closer together and more exciting; there are numerous Class III and IV rapids, including the infamous Skull Rapid. In-between the rapids, you’ll have a chance to explore Native American petroglyphs and outlaw hideouts which are scattered throughout the isolated canyon. We meet at 7:00 PM at the Gonzo Inn in Moab for a pre-trip meeting. This is an opportunity to meet your fellow travelers and ask any last-minute questions. Your trip leader will give you a thorough trip orientation and pass out your waterproof river bags so you can pack your belongings that evening. We’ll get going first thing in the morning, enjoying the dramatic desert scenery unfolding around us on the drive to the put-in at the Westwater Ranger Station. Upon arrival at the boat ramp, our guides will present a safety talk and orientation to our boats and gear. Our trip begins with calm waters allowing us to take in the stunning canyon walls and desert scenery. A few Class II rapids will give us a taste of what lies just downstream. We’ll stop for lunch on a warm sand-covered beach. Our guides will create a delicious riverside meal while we enjoy the beauty of the canyon. Whatever they prepare, it will always be fresh and filling to energize us for the rapids just ahead. While they prepare the meal, you can swim in the calm beach waters or lounge in the sun. We will stop in the afternoon to set up camp on a spacious sandy beach. Your guides will prepare dinner and hors d’oeuvres while you set up your tent. You’ll have time to explore the campsite, lounge on the beach, chat with your traveling companions, or relax with a great book while your meal is being prepared. After dinner, the evening is yours to spend as you please. We may enjoy stories and jokes shared in the “living room” or you may choose to simply relax and reflect on the starry night sky rising above you from the walls of the canyon. We will start the day early with hot coffee while our breakfast is prepared. We can watch the sunrise paint the canyon walls while eating our delicious breakfast. After breaking down the camp we are off to run Westwater’s famous rapids: Little Dolores Rapid, Funnel Falls, Skull Rapid and Sock-It-To-Me! After the excitement of the rapids, we still get to look forward to more of the deep canyon walls and swift currents of Westwater Canyon. After another hearty and delicious riverside lunch we may swim or explore the canyon before heading back to the rafts. In the afternoon we will arrive at Cisco Landing where our Colorado River adventure ends. The drive back to Moab will allow time for peaceful reflection. Once back in Moab, we will say our goodbyes to our new friends and our guides but we will never forget the experience we have shared. Sleep Kit: Can be rented for $25 per person. Sleep kits consist of a sleeping bag, deluxe 3-inch thick foam and air-filled sleeping pad, ground tarp, sheet, pillow and pillowcase. 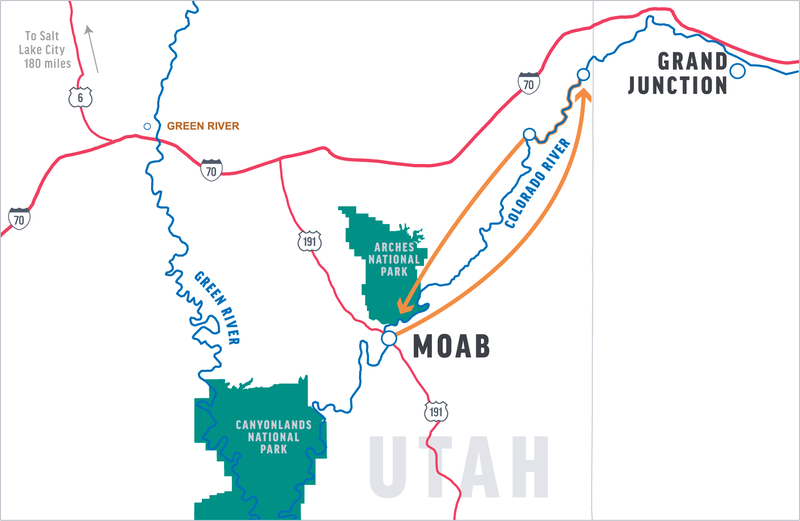 The day before your trip we will meet at 7:00 PM at the Gonzo Inn in Moab for a pre-trip meeting. Your trip leader will provide a thorough trip orientation and pass out your waterproof bags so you can pack your belongings that evening. The trip leader will also confirm the meeting time for the following morning and give you an opportunity to ask any last-minute questions. If you’re arriving by car, parking is available at the OARS Warehouse, while on the river. The Colorado River can exhibit extreme variations in water level at different times of year, providing a whitewater experience for everyone. This portion of the river boasts narrow rapids through steep canyon walls interspersed with wide calm stretches. The remote beauty of the canyon combined with the consistent riffles and Class IV rapids make this a perfect river stretch for travelers of nearly all ability levels. Paddle Raft—The sportiest of crafts we put on the water, everybody handles a paddle while the guide gives directions and steers and gives directions from the rear. Paddling together is essential to finding the right run, and teamwork begets success. A thrilling way to brave the rapids! Helmets required. Ask an Adventure Consultant about this option, as it is not available on every trip. After our day on the river, we pull ashore to camp for the night. Upon arrival, our first task is to unload the boats using a bag line of crew and passengers to expedite the process. Individuals then collect their waterproof bags and locate an area on the beach to camp for the night. A crew member will give a demonstration on setting up a tent, which you’ll see is quick and easy. The guides will set up the kitchen and central dining/seating area with camp chairs. They will also locate a secluded area away from camp to set up the portable toilet, where privacy is assured. Westwater Canyon has several great hiking trails. While we generally plan a guided hike on each trip, there is ample opportunity for the curious to explore the area at length. Please let your trip leader know if you are an avid hiker and remember to bring extra water bottles and good shoes. Remember, however, that all hikes are optional and you can choose to lie on the beach and take in a few tanning rays or read a book instead. Lastly, the Trip Leader must consider to overall ability of the group when deciding what hikes to offer. *The use of drones is prohibited by the Bureau of Land Management in Westwater Canyon. You may want to check one week prior to your trip for an up-to-date weather forecast. We recommend you check the following web sites: www.weather.com or www.wunderground.com for weather in Moab, UT. The flow of the Colorado River through Westwater Canyon is generally unregulated, meaning no single reservoir controls the water level. The river can reach flows considered extreme during spring runoff in years when the high country feeding the Colorado River watershed has received a plentiful snowpack. Peak run-off through Westwater Canyon usually occurs between mid-May and mid-June, but can vary widely from early May and into July. High water trips equate to a more intense whitewater experience and a high level of physical fitness is recommended. Water temperatures are coldest during the high water period and rain gear and warm synthetic clothing will be required. June and September Trips: During the fall, the sun is not far enough north in the sky for its warming rays to reach down into the river canyon for as many hours a day as it does in the summer. This means more shady areas, fewer sunny ones. Therefore, when you are splashed (drenched) going through the rapids and you’re in a shady area, you will get very cold unless you are prepared. Bugs and mosquitos vary depending on location and time of year. It’s a good idea to come prepared with insect repellent. Long sleeved shirts and pants may be desirable at times. At the pre-trip meeting each person will be given two large waterproof bags (approximate sealed size: 13” diameter x 25” tall; 3318 cu in; 54.4 L). One bag will be for your clothing and personal items; the other bag will be for your sleeping gear (sleeping bag, sleeping pad, ground tarp, sheet and pillow). These two bags will be your “checked luggage” and will only be accessible in camp. Tents are stowed separately. Please note: if you rent our sleep kit, it will come already packed in one of the 2 waterproof bags issued to each passenger. We also provide a small waterproof bag for day use where you can keep items such as raingear, camera, sunscreen, lip balm, etc. (approximate sealed size: 17” tall x 9” diameter; 1081 cu in; 17.7 L). The bags are cylindrical in shape and pack from the top. Please pack light, and keep in mind that river attire is casual: comfort, convenience and boat space take precedence over style. At the end of the trip, you will return to Moab with your waterproof bags, where you will be able to unpack your gear before your trip home. A $250/person deposit is required at the time of booking. Deposits may be made by check, money order or Visa/Mastercard (American Express and Discover incur a 3% processing fee). Receipt of the initial deposit signifies acceptance of our complete Terms and Conditions. Individual departures and trip capacity are strictly limited by the managing agency. Cancelling your trip will incur cancellation fees because holding spots for you means we are likely turning others away who would like to book the trip. Final payment is due 90 days prior to departure. Accounts on which final payment has not been received 80 days prior to the departure date will be cancelled without exception. Everyone is required to sign a standard Acknowledgement of Risk before the trip, acknowledging awareness that there are inherent risks associated with the trip. However, due to the nature of the activities, a condition of your participation is that you will sign this form and return it to our office before the trip begins. Anyone who refuses to sign the form will not be allowed to participate, and consistent with OARS cancellation policy, there will be no refund of the trip fees at that time.